1) The location of the injury : - In general, injuries that are higher in your spinal cord produce more paralysis. For example, a spinal cord injury at the neck level may cause paralysis in both arms and legs and make it impossible to breathe without a respirator, while a lower injury may affect only your legs and lower parts of your body. Paralysis of the lower half of the body is called paraplegia. 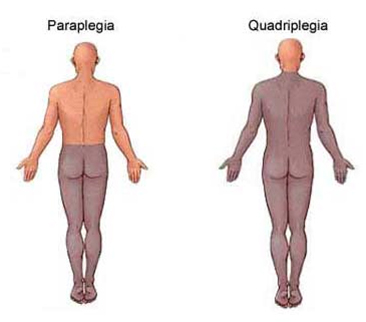 Paralysis of both arms and legs is called quadriplegia. 2) The severity of the injury : - Spinal cord injuries are classified as partial or complete, depending on how much of the cord width is damaged. your spinal cord and your brain make up your central nervous system, which controls most of the functions of your body. Your spinal cord runs approximately 15 to 17 inches from the base of your brain to your waist and is composed of long nerve fibers that carry messages to and from your brain. Although a spinal cord injury is usually the result of an unexpected accident that can happen to anyone, some groups of people have a higher risk of sustaining a spinal cord injury. Magnetic resonance imaging (MRI) : - MRI uses a strong magnetic force and radio waves to produce computer-generated images. This test is extremely helpful for looking at the spinal cord and identifying herniated disks, blood clots or other masses that may be compressing the spinal cord. But MRI can't be used on people with pacemakers or on trauma victims who need certain life-support machines or cervical traction devices. Emergency actions Urgent medical attention is critical to minimizing the long-term effects of any head or neck trauma. So treatment for a spinal cord injury often begins at the scene of the accident. In the early stages of paraplegia or quadriplegia, your doctor will treat the injury or disease that caused the loss of function. During your hospital stay, a rehabilitation team will work with you to improve your remaining muscle strength and to give you the greatest possible mobility and independence. Your team may include a physical therapist, occupational therapist, rehabilitation nurse, rehabilitation psychologist, social worker, dietitian recreation therapist and a doctor who specializes in physical medicine (physiatrist) or spinal cord injury. You may benefit from medications that manage the signs, symptoms and complications of spinal cord injury. These include medications to control pain and muscle spasticity, as well as medications that can improve bladder control, bowel control and sexual functioning. You may also need short-term medications from time to time, such as antibiotics for urinary tract infections. Inventive medical devices can help people with a spinal cord injury become more independent and more mobile. Some apparatuses may also restore function. Improved, lighter weight wheelchairs are making people with spinal cord injury more mobile and more comfortable. Some wheelchairs can even climb stairs, travel over rough terrain and elevate a seated passenger to eye level to reach high places without help. Computer-driven tools and gadgets can help with daily routines. You can use voice-activated computer technologies to answer and dial a phone, or to use a computer and pay bills. Computer-controlled technologies can also help with bathing, dressing, grooming, cleaning and reading. These sophisticated devices use electrical stimulation to produce actions. Some are implanted under the skin and connect with the nervous system to supplement or replace lost motor and sensory functions. Others are outside the body. They are often called functional electrical stimulation (FES) systems, and they use electrical stimulators to control arm and leg muscles to allow people with a spinal cord injury to stand, walk, reach and grip.